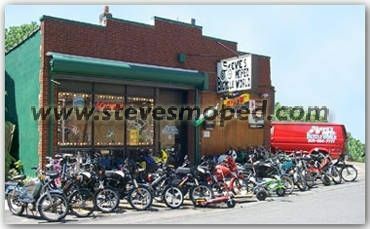 Steve's Moped and Bicycle World Inc. is a unique store in New Jersey. We provide the highest level of technical expertise on all two and four cycle engines. We sell and service all bicycles, power equipment, skateboards, mopeds, scooters, go carts, mini-bikes, motorized skateboards and go-ped motorized skateboard /scooters. We are factory certified for the following engine lines: Briggs & Stratton, Tecumseh, Kohler, Kawasaki, all moped engines and much more! We are your source for parts and technical information on these and other brands. Please explore this site and check out our weekly specials. Call or e-mail us for a free brochure on any of our regular products, or for any information on those hard to find moped parts. We ship anywhere fast! We have the largest most diversified stock of moped parts in the entire United States. We have been shipping moped parts all over the world since 1978. We are a well known and respected source for design, testing, troubleshooting and repair of mopeds and two cycle engines in the United States and abroad. We design and provide specifications for moped components and sell them in foreign markets. We have been to moped factories on several continents to provide design improvements, technical support and diagnostic training for moped technicians. We are the leading source for high performance parts for all makes and models of mopeds. If you are looking for the absolute best in parts and service, look no further. available in the local Bergen County area.